Welcome to our awesome April issue. As well as bringing blue skies, springtime flowers and the smell of freshly-cut grass, April also brings with it my birthday. 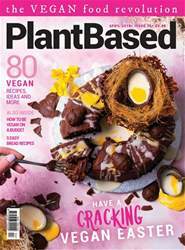 Now, I’m sure when you picked up this copy of PlantBased from the supermarket mag stand, or off your front door mat, you expected to read more about food, fitness and vegan icons, than about me reaching the ripe old age of 24. That’s an understandable expectation, and yet, here we are. But, roll with me on this – there’s a point. Birthdays are catalysts for ‘big thoughts’, for contemplating life’s larger issues, the choices you’ve made over the last year, and what you hope to achieve next – a bit like New Year’s Eve, but with more cake. In this last year, I’ve transitioned to a vegan lifestyle. It has completely altered my viewpoint on so many factors in life, as I believe it does for most new vegans. We become more educated on the topics of health and environment, but, unfortunately, also become more aware of the horrendous suffering that goes on in the world – especially in consideration to our animal friends (I once thought that it must have been a vegan who coined the phrase ‘ignorance is bliss’; it was actually Thomas Gray). But it’s nice to know that in one full year of veganism, you, I, or any vegan, could have saved 401,500 gallons of water, 10,950 square foot of forest and 365 animals' lives. So the point is: don’t give up! Strive to do as much as you can, and take time to reflect and ask yourself: ‘what more can I do to help?’. Also this issue, we’re dipping our toes into the tropical pool that is Asian cuisine. Turn to page 40 to try our delicious plant-based Asian recipes. And if you’re focussing on another celebration this month i.e. Easter (don’t worry, I won’t take offence) then check out page 16 for our chocolate bundt cake recipe – it’s the perfect teatime treat for the big day. Have an egg-cellent vegan Easter!